Well, howdy - I can't believe it is all over, but there you have it - we have finished the Z entry, and what a journey it was! I loved every minute of it. Here are my answers to the proposed questions that Arlee gave us to kind of give us focus on the evaluation. 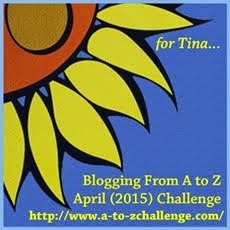 1) What attracted me to the A to Z Challenge? Well, now, folks, anyone who really knows me would say that the word 'challenge' will almost always get my attention. I play games on the computer that I have a tough time winning. Sometimes I never win, but it doesn't stop me from trying. All I have to hear from anyone is "you can't do that" and off I go, and as my mom would have said, "Ruby, you would do it or bust a gut trying." ha. 2) Did I feel intimidated by the Challenge? Naw, not by any means. I have been reading for 70 years and have stored up a lot of language skills (sorry, I don't mean to sound conceited, but truth is truth). Just stating the facts, man. I love words. 3) Did I ever feel like quitting? What kept me going? Not a chance! Never say die - that's me. Just ask my daughters and they will tell you. 4) What did I think was my greatest contribution? Hmmm. Maybe humor and variety of subjects. 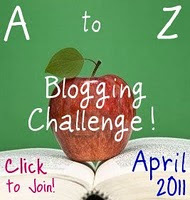 5) In finishing this challenge, do I think I might be more apt to try other blogging or writing challenges? I don't know...it depends on what the subject matter or style of challenge it is (or they are). 6) Did I feel like I had done my best in this challenge? What could you have done better? I feel like I did the best with what I had. Perhaps I could have personalized my replies to people's comments more. I am more inclined to do the scattershot method of replies since most people write very similar comments, so I just reply in general rather than specifically. I do reply thinking about what each person has commented. I am rather new at getting a lot of comments. What a pleasant new thing that is! Thank all of you! 7) What did I learn from it? Well, for one thing, I learned a lot about different areas of the world from the variety of fellow bloggers that are connected with me. It is wonderful! I found a lot of people have much in common regardless of where they live or what they do for a living. I discovered many different styles in the way people express their thoughts, their dreams and their everyday lives. I also discovered that many are professional writers. Wow! I have been in touch with people that have authored books and are going to have books published. I have made friends that I know are going to be in touch often with me, and I with them. I have found many new people to love. I am blessed. I have discovered fellow believers with whom I have many common threads. I am indeed blessed. 8) Will I be blogging any more often now than I used to? Well, actually, I am not far away from 500 postings. I have been blogging for almost 23 months, so I believe I have posted most days except for last summer when I was so very ill I didn't much care if I posted much or not. I praise God that He healed me to where I am today. I do thank all those who prayed for me and that continue to do so. 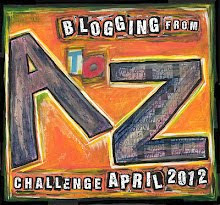 This is Blabbin' Grammy's evaluation of the A to Z Challenge. Bye for now. More later. Much love to each of you, my friends. I think you did awesome, Grammy! I've enjoyed your reflections on the past. Hi Ruby an excellent account of how you found the challenge. I am pleased for you that you have more followers, you deserve more than you had as I know you wrote nearly every day. Hi Grammy, I have been worried about you all with all the rain in Tennessee and flooding. We are getting it here now. I have enjoyed reading your posts with this challenge and your are certainly a writer, too. I love the picture of you in your pink hat and suit below. 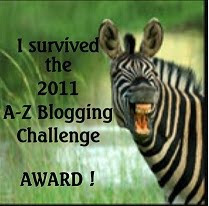 as you know i'm a new follower here and didn't come into your blog but 3-4 times during the challenge. 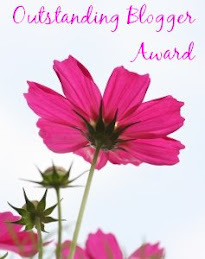 but in the next couple of weeks i will be sure to go back thru your A to Z posts and perhaps learn something:) you certainly deserve a congratulations though! 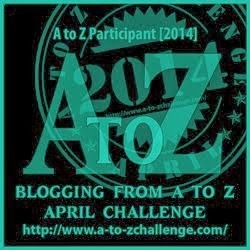 Ruby, that was a wonderful evaluation of the A to Z Challenge. You are a veteran prolific blogger and the daily posting was nothing new to you I know because I saw what you were doing before. I am so in agreement with all you said. One of your excellent strengths was the way you commented and connected with people. 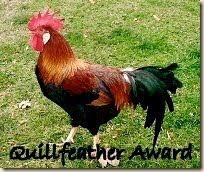 I think you've got some steadfast fans now, me being one, who will keep coming back for more Blabbin' from Grammy cause you are good with words. Oh, and the winnners badge looks good on your site along with the other awards you acquired. Job well done! and funny your blog is! Ruby, you are a doll and I have enjoyed reading all your posts...so glad I met you through the challenge, I also gave you a shoutout on my mega reflection post! I always looked forward to your posts throughout the month. Did not leave as many comments as I should have, because it doesn't really make sense to leave a comment that only says what a dozen other people have said before me. But now that the Challenge is done, I am going to comment more often because I am sure the number of comments will now go down. Getting to know you was one of the highlights of the challenge for me. And I hope Gramps has settled down now. Nice to see you the other day and thanks for the comment. Congratulations of reaching the end of April and talking about each and everyone of the letters. 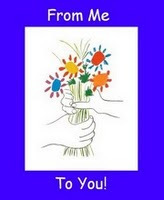 I don't think you know this but I've been reading your blog for quite a while now - have no recollection of where I first saw you but have been engrossed with your daily messages of hope for those caring for Alzheimer sufferers. I'd been watching my Aunt go downhill for a while and could relate to all the things you mentioned that was happening with Gramps. You have my admiration because my cousin and I decided it wasn't practical for us (even with daily home care) to care for her in her or our home and for her own safety is now in Nursing Home. So as said I was quite taken with the idea of the challenge the day you mentioned it a few weeks ago now - and as they say the rest is history. So thankful to each of you for what you contribute to my daily life! I must say congratulations to each of you also for the completion of A to Z, and even if you didn't, that is okay, too. Most of you lead much busier and more productive lives than I do. Going to work, caring for little kids, husbands, school and school work are all full time work. I know, because I've been there. 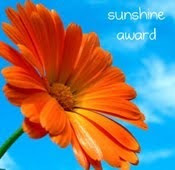 Thank you, Tori, for the Sunshine Award, and I will pick it up when I return from Texas next week. I hope I will continue to hear from all of you, my friends. I will be blogging from Texas, but on my daughter's 'puter. I understand what you were saying, Rayna, about not always leaving a comment, because it would just be repeating what someone else would be saying. OOPS, this is going rather long, isn't it? sorry. I am ready to take off so I turned my 'puter back on while I am waiting for my neighbors to come and take me to the airport. I am leaving my car with them so she can use it while he is at work. I just now saw your comment. How very sweet you are and I am glad to "meet" you. I will be in touch. Thank you for your very kind words and I know you mean them. Yes, Alzheimer's is such a debilitating disease and so cruel. I empathize with you and your cousin in what you had to do with your aunt. I know that someday down the road I may have to do the same unless I pass on before he does. I don't look forward to it. Thanks again for speaking to me and letting me know that you are a reader. You have another faithful follower in me. 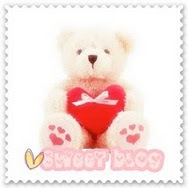 I will try to comment as much as I can, because comments are like hugs for bloggers. I looked forward to your posts over this past month and am entartained beyond my expectations every time I visit.